Sony Pictures Television (SPT) has announced the upcoming launch of a new digital broadcast network aimed at reaching the classic-film fan. GetTV will launch in the United States some time this Fall. The production company is a small screen distribution subsidiary of Sony Pictures Entertainment. Sony Pictures Television was initially known as Screen Gems in 1948; the company reincorporated as Columbia Pictures Television in 1974; and merged with sister studio TriStar Television (formed in 1986 and relaunched in 1991) to form Columbia TriStar Television in 1994. The name was changed to reflect the Sony brand in 2002. The network will focus chiefly on content from Hollywood’s Golden Era, consisting of titles from the Sony Pictures’ archives. They own approximately 3,500 films, such as The Bridge On The River Kwai and Lawrence of Arabia. SPT jointly owns rights with Fremantle Media to most of the post-1947 Bob Hope movie library, including My Favorite Brunette, The Lemon Drop Kid, The Seven Little Foys, and Son of Paleface. SPT also handles the Columbia TriStar Pictures theatrical library, The Three Stooges, and classic television titles, such as The George Burns and Gracie Allen Show, Route 66, Dennis the Menace, and Hazel. This could be a very interesting channel to compliment TCM. 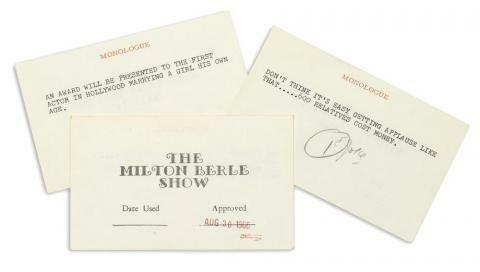 Milton Berle’s jokes are set to go on sale today, just eleven years after he died in 2002. The comedian had four cabinets holding hundreds of 3×5 cards set to be sold in Los Angeles. Berle was best known as the host of the Texaco Star Theater on television, and this show was a breakthrough on the small screen. His index cards are set to sell between $10k and $15k. This entry was posted on Sunday, May 5th, 2013 at 2:16 am	and is filed under Blog by Manny Pacheco. You can follow any comments to this post through the RSS 2.0 feed. Responses are currently closed, but you can trackback from your own site.